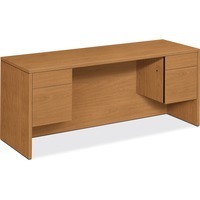 HON 10543 Credenza HON10543CC $542.89 Kneespace credenza with 34 pedestal is part of HON 10500 Series Wood Laminate Desking that offers practical functionality and uncompromising durability. Durable, 1 18 solid core, high performance particleboard resists warping. Laminate is scratch resistant, stain resistant and spill resistant. Credenza features one box and one file drawer in each pedestal. Drawers lock and offer five sided construction for easy drawer alignment or replacement of drawer fronts. Interchangeable core removable lock makes rekeying quick and easy. Box drawers operate on ball bearing suspension with 34 extension while the file drawers extend fully on ball bearing suspension. Included hangrails are designed for side to side, letter size or legal size filing and front to back letter size filing. Formal, full height modesty panel features one cord, pass through the grommet in the top center for easy access to wall electrical outlets. Credenza is not designed to be used with modular or mobile pedestals.